(Nanowerk News) Beneath the surface of the earth, an influential community of microbes mingles with plant roots. In the first large-scale analysis of those communities, scientists have now catalogued and compared the hundreds of types of bacteria that associate with the roots of the model plant Arabidopsis under various conditions. The work establishes an experimental framework for examining how plants interact with a microbial community that can influence their growth and development, productivity, and impact on the environment. The analysis, led by Jeff Dangl, a Howard Hughes Medical Institute-Gordon and Betty Moore Foundation investigator at the University of North Carolina at Chapel Hill, identifies a core group of bacterial types that are consistently found inside Arabidopsis roots. Other bacterial associations, the researchers find, are dependent on the type of soil in which a plant grows. The work is published in the August 2, 2012, issue of the journal Nature. An emerging lateral root covered in bacteria (shown in green). Stuck in the same plot of soil for its entire life cycle, a plant must sense and adapt to its nutritional environment, Dangl explains. Scientists speculate that a plant may recruit certain microbial aides to help it thrive under certain conditions, but these types of interactions remain largely unstudied. Almost nothing is known about how a plant’s genes influence the establishment of a microbial community in and around its roots, Dangl says. Over the past 25 years, Dangl has used molecular biology to define the defense system that plants use to protect against pathogens, teasing out the roles of individual genes in the plant immune system. “Our studies have focused on binary interactions: one plant, one microbe, in controlled lab conditions,” he explains. “We’ve learned a lot from those studies, but eventually you reach a point where you can keep drilling deeper into something you already know, or you can blaze a new trail.” It was time, he decided, to investigate plant-microbe interactions in a way that better reflected the complex reality of life underground. So Dangl turned to the model plant that he has studied for most of his career, the white-flowered weed Arabidopsis thaliana. With graduate students Derek Lundberg and Sur Hererra-Paredes and postdoctoral fellow Sarah Lebeis, he planned an experiment to compare the populations of microbes in and around the roots of hundreds of Arabidopsis plants, grown in different soils and with different genetic backgrounds. Lundberg left the lab and returned with buckets full of soil from two locations: a nearby North Carolina farm and an experimental plot of land on the UNC campus. The campus plot had not been farmed in more than 100 years, and therefore had a very different chemical composition and a unique population of microorganisms as compared to the farm soil. After removing native worms and insects and crushing each soil sample to produce a homogenous medium, Lundberg and the team used it to plant microbe-free seedlings from a variety of inbred genetic backgrounds. Soon, the plants were growing rapidly and the team was able to collect roots and the surrounding soil for analysis. They removed each of more than 600 plants from its pot and gently shook it to remove all but the soil in closest contact with the roots – a microenvironment known as the rhizosphere. After they collected the rhizosphere soil and rinsed the roots clean, they ground the roots up so the microbes within the root cells could be sampled, as well. A few weeks later, when the plants were more mature and growth had slowed dramatically, they collected roots and soil again. To catalog the diversity of bacteria in each sample, the scientists used a method of identification based on the sequence of the 16S ribosomal RNA (or 16S rRNA) gene, which is present in all bacteria but variable enough to distinguish between most types. For the massive sequencing effort, Dangl’s team collaborated with scientists led by Susannah Green Tringe at the Department of Energy’s Joint Genome Institute (JGI) in Walnut Creek, California. Parsing the data from the sequencing required tremendous computational power and new methods of analysis. “We relied heavily on JGI’s established expertise in informatics,” Dangl says. “But we also realized that eventually you’ve got to be able to do it yourself.” The two graduate students were joined by computational biology graduate student Scott Yourstone, and the team took on the analysis of 16S rRNA sequencing data for more than 1,200 different samples, each one containing a diversity of species, including devising a classification system to categorize the types of bacteria they found. The team found that, as expected, the soil that clung directly to the plants’ roots housed only a subset of the bacteria found in the surrounding soil. A handful of types were particularly commonly at this root-soil interface, whereas other types were absent, despite being present in the soil in which the plant had grown. Inside the root, these effects were amplified: even fewer species had settled in and concentrated their numbers inside the plant’s cells. That indicates that there is some selection of which bacteria in the soil are able to associate with the plant root. “We don’t know if it’s the host’s ability to attract the bug or the bug’s ability to inhabit the niche, or both…but now we can do the experiment,” Dangl says. When they compared which microbes were in and around the roots of plants grown in the two soils – each with a distinct native population of bacteria, as well as a unique nutritional profile – the team found some overlap, but also some differences. In fact, Dangl notes, in a paper published in the same issue of Nature, a research team in Germany using similar methods reports that they found a very similar core group of microbes in and around the roots of Arabidopsis plants grown in two German soils. 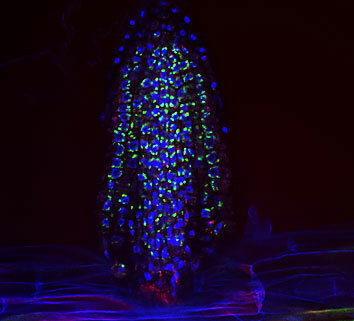 “The core in the center tells you Arabidopsis wants some set of microbes, and they want Arabidopsis. But the soil-specific interactions suggest that in different soil and nutrient compositions, the plant might need to recruit certain bugs to provide particular ecosystem services.” Understanding the relationship between soil chemistry, a plant’s nutritional needs, and the microbes with which it interacts could let researchers develop probiotic additives that help plants flourish in particular environments, he says.